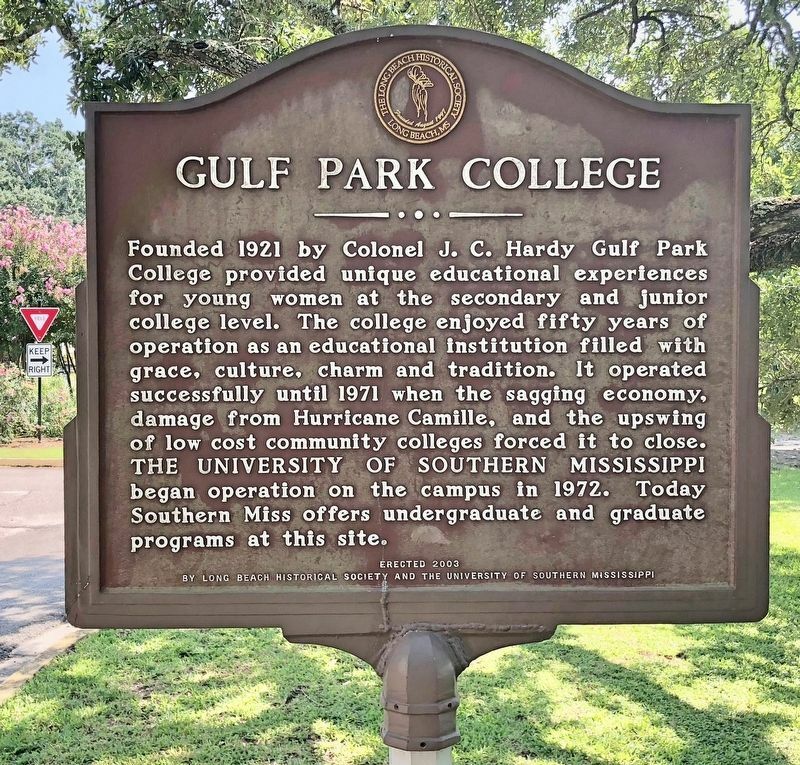 Founded 1921 by Colonel J. C. Hardy Gulf Park College provided unique educational experiences for young women at the secondary and junior college level. The college enjoyed fifty years of operation as an educational institution filled with grace, culture, charm and tradition. 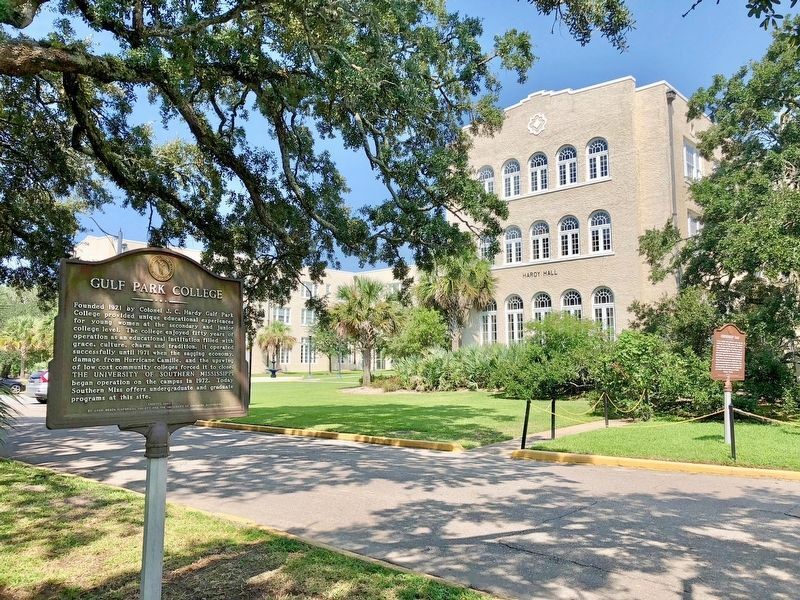 It operated successfully until 1971 when the sagging economy, damage from Hurricane Camille, and the upswing of low cost community colleges forced it to close. The University of Southern Mississippi began operation on the campus in 1972. Today Southern Miss offers undergraduate and graduate programs at this site. Erected 2003 by Long Beach Historical Society and the University of Southern Mississippi. Location. 30° 21.086′ N, 89° 8.164′ W. Marker is in Long Beach, Mississippi, in Harrison County. Marker is on Avenue of the Oaks east of Gulf Park Drive, on the right when traveling east. Touch for map. Located across from the Friendship Oak. Marker is at or near this postal address: Avenue of the Oaks, Long Beach MS 39560, United States of America. Touch for directions. 2. View from marker towards the Hardy Hall Administration building.
. Friendship Oak (a few steps from this marker); a different marker also named "Friendship Oak" (within shouting distance of this marker); Administration Building (about 300 feet away, measured in a direct line); St. Thomas the Apostle Catholic Church (about 800 feet away); Early Long Beach (approx. 0.2 miles away); a different marker also named Early Long Beach (approx. 0.4 miles away); Long Beach Presbyterian Church (approx. ¾ mile away); Hurricane Katrina / Storm Recovery (approx. 0.9 miles away). Touch for a list and map of all markers in Long Beach. More. Search the internet for Gulf Park College. Credits. This page was last revised on August 24, 2018. This page originally submitted on August 24, 2018, by Mark Hilton of Montgomery, Alabama. This page has been viewed 36 times since then and 8 times this year. Photos: 1, 2. submitted on August 24, 2018, by Mark Hilton of Montgomery, Alabama.